Dizzying heights and dazzling scenery greet bikers on trails north of Bend. CROOKED RIVER RANCH, Ore. — The cliff walls were completely vertical, and I glanced down and saw the Crooked River flowing hundreds of feet below the sheer drop-off. Feeling a bit dizzy from the height, I backed away from the edge of the cliff and into the safety of the sagebrush and the sand, got back on my bike and continued along the rocky, canyon-side path. 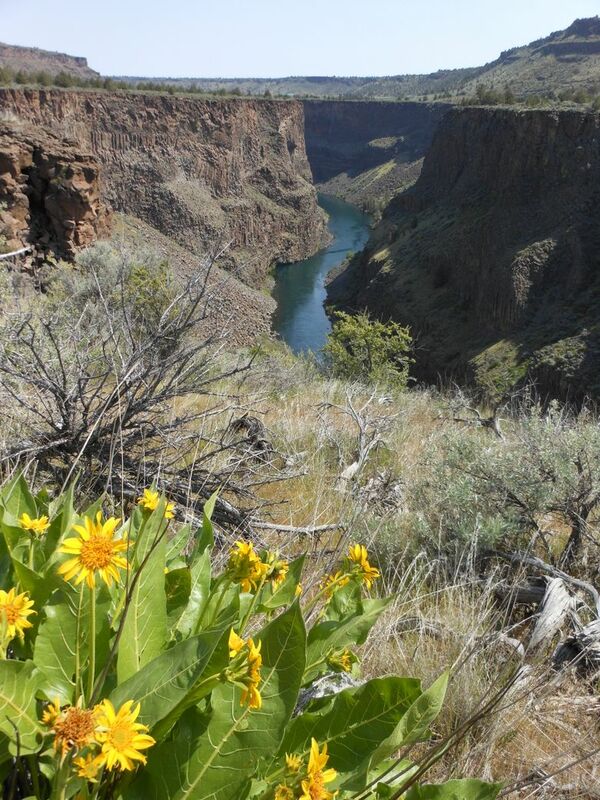 Central Oregon’s High Desert has some magical places to visit in the spring, and the Crooked River Gorge is certainly one of them. Although many folks make the trip to Crooked River Ranch to golf at the renowned course there, I drove just a few miles farther lto the Otter Bench trailhead. From there, mountain bikers can ride the trail along the hillside to the Opal Canyon loop trail. Those two trails are the only ones in that area open to bikes. The 300-foot-deep, 4-mile-long gorge offers some of the most breathtaking desert scenery in Central Oregon, and I was eager to experience it by mountain bike. I had hiked the trails there, but this was my first time biking them. The relatively new trail system on the western edge of Crooked River Ranch was completed and designated in 2010 by the Bureau of Land Management’s Prineville District. The trail system offers hikers, mountain bikers and equestrians a chance to explore the gorges carved over the centuries by both the Deschutes and Crooked rivers. The trails — about 10 miles in all — include new sections and some reconstructed paths that anglers have hiked for decades to travel down the canyon walls and reach the rivers below. While the trails were already a bit dusty, I was determined to get out there during the spring before the daytime temperatures become uncomfortably hot in the summer. After riding single-track along the hillside through juniper and sagebrush for about 30 minutes, I arrived at the intersection of the Otter Bench, Pink and Opal Canyon trails. The Pink Trail is closed to bikes, so I turned onto the Opal Canyon Trail, where I was met immediately by an uphill, rocky technical section that required me to dismount my bike and hike. After a short trek, the trail emerged on the side of a cliff that offered breathtaking views of the deep, rugged canyon and the river far below. The terrain called for some caution on a bike, as I negotiated the rocky trail, which ran along the edge of the canyon, the drop-off just a few feet away. The trail provided several sections where I could get off my bike and walk to the canyon’s edge. At one such spot, I walked out to some rocks and peered down. It was such a straight drop that all I could see below was the river. Back on the bike, I continued on through what some locals refer to as Central Oregon’s mini-Grand Canyon. The desert was birdy and buggy on the mild, sunny day. Black crows cruised on thermals out over the canyon, and twice small bugs met their demise on my sunglasses — and I was not even going that fast. I also saw a small snake slither into the bushes when it sensed me coming. After a mile or so, the trail looped back up to a higher point on the ridge, then started leading me back toward the Otter Bench Trail. Another trail in the area, the Horny Hollow Trail, is hiker-only and is closed from Feb. 1 to Aug. 31 to protect breeding wildlife that are sensitive to human activity. I cruised back toward the parking area on the Otter Bench Trail, the last half-mile mostly downhill. I had ridden about 7 miles in 90 minutes and noticed I had some energy left, so I repeated the loop to make it about a 14-mile, three-hour ride. Many of the BLM trailheads at Crooked River Ranch — Otter Bench on the Crooked River and Steelhead Falls, Foley Waters and Scout Camp on the Deschutes — are reachable via public roads. The hiker-only Steelhead Falls and Foley Waters trails, both popular among anglers, have existed for many years but are now defined and designated by the BLM. Scout Camp, like Otter Bench, is relatively new. Located in the Steelhead Falls Wilderness Study Area, the Scout Camp Trail is a way for hikers to descend to the Deschutes River. But for mountain bikers, the Otter Bench and Opal Canyon trails just might be the best way to experience the dramatic desert scenery — and dizzying heights — of the Crooked River Gorge. Directions: Turn west on Lower Bridge Road, off U.S. Highway 97 just north of Terrebonne, Ore. Follow signs to Crooked River Ranch. To find the Otter Bench Trailhead, continue past the golf course to the end of the road, about 11 miles from Highway 97. Look for a trailhead sign and map. Parking is free. Features: Dramatic desert scenery and cliff-side riding on single-track along the Crooked River Gorge. Distance: About 7 miles total. Rating: Aerobically easy and technically intermediate.